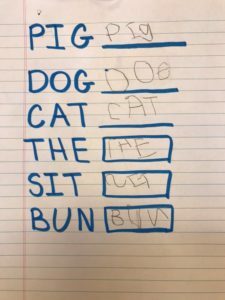 Just like everything else when it comes to children, each child’s handwriting — from basic quality to style and legibility — is different and may develop at different times. Hand dominance: Does your child over the age of 4 have an established dominant hand? Pencil grip: How does your child hold a pencil or a crayon? Does he or she use the thumb, index and middle fingers? 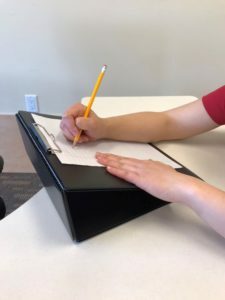 Hand stability: Does your child rest the pinky side of the hand on the table when writing? Wrist position: Is your child’s wrist pulled back and able to support free movement of the fingers? Sitting posture: Are your child’s feet firmly on the floor and arms supported on the table? Line awareness: Are most of the letters and words on the line, or do they float above/dip under it? Letter size: Are the letters approximately the same size? Spacing: Is there consistent spacing between letters and between words? Direction: Does your child start letters at the top and write top to bottom, left to right? Mood: Is your child having fun? While the fundamentals of handwriting will continue to be developed, these tips can help all children enhance their writing skills at any age. A child’s posture and body positioning are the first areas to assess while engaged in a handwriting task. Sitting on a chair, the child’s feet should be flat on the ground. If the seat is too high, provide an item for the child’s feet to rest on (step stool, pile of books, etc.). Supported feet will create 90-degree angles at the ankles. The child’s knees and hips should also be at 90-degree angles as he/she sits upright in the chair. Lastly, the child’s forearms should be supported on the table surface. As the child’s arms are supported on the table, observe how he/she is turning or bending their dominant wrist and forearm while writing. The child’s dominant forearm, wrist and “pinky side” of the hand need to be stabilized on the table. When the “pinky side” of the hand is grounded on the table, the “thumb side” of the hand can move more fluidly while writing. The child’s wrist should not curl downward while holding a pencil. A slant board or angled surface is a great tool to use to assist a child with developing the proper body mechanics while writing. 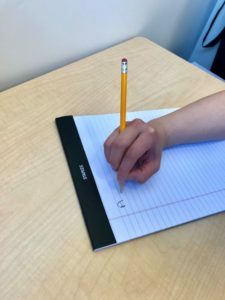 Placing the writing paper on an angled surface will help the child stabilize his/her forearm and hand and promote extending the wrist. Addressing a child’s grasp pattern is also important in order to improve the child’s writing speed, coordination and fluidity. The developmental progression of pencil grasps is: fisted grasp, digital pronate grasp, four-finger grasp, quadrupod grasp and tripod grasp. Every child’s hand strength and grasp patterns mature at different times, so one child may have an advanced grasp earlier than another child. The goal is for a child to sustain holding a pencil with adequate strength at their fingertips. Before children write the alphabet, they need to begin with developing their pre-writing skills. The first stage is to imitate and trace vertical lines, horizontal lines and circles. The next pre-writing skills are to imitate and trace basic shapes (square, triangle), diagonal lines and intersecting lines. Once these skills are achieved, then the child can progress to imitating uppercase letters. Similar guidelines apply with learning how to write uppercase letters correctly. The first group of letters to imitate are letters consisting with only vertical and horizontal lines (L, I, E, F, H, T) followed by letters with curves (O, C, D, B, J, U, S, G, P, Q). Letters with diagonal lines (W, R, Y, A, K, Z, X, V, N, M) are typically developed last due to their complexity. MOTION occupational therapists work every day helping children who are struggling with handwriting for any reason. If you are concerned about your child in any of the above areas, or if your child’s teacher has raised concerns, please request an appointment with one of our MOTION occupational therapists here: https://motionptg.com/request-appointment/.